According to the statistics of the WAF Anti-Doping Committee, increasing the number of tests during competitions contributes positively to reducing Adverse Analytical Findings. At the same time, we understand that doping control can not be the only preventive tool, there are also being made advances in education and outreach programs. At the moment, we noticed the increase in confusion and indignation amongst the athletes with reference to the selection criteria for athletes undergoing doping control. I have often heard proposals to test all the top-three, or even more, testing the top-five in each category. Of course, it would be ideal to implement such a testing plan, but there are certain difficulties and circumstances that do not allow this, not only from a financial point of view, as some believe, but also on the basis of the recommendations of the International Standards governing the Activity of Anti-Doping Organizations. It is known that the European and World Armwrestling Championships take place both on weight categories, right and left hand but also on age classes. The number of weight categories is extremely high (each 5 kg for seniors), plus the junior, master, grandmasters, senior grandmasters, disability categories, plus gender categories (women, men). The tests are spread to cover as much as possible of participants, but this is impossible, remaining only at the trend level. In the past few years, around 60-70 tests have taken place in a championship and if the cost of the doping test kit is known, then the cost of the laboratory analysis can not be predicted from the start, here I am referring to more and more recent atypical findings that require additional analyzes that sometimes even double the cost of the Basic Analysis. That is why the question of athletes, which is the cost of analyzing a sample of urine, is not welcome, or an answer from the start can not be given. Testing priorities for athletes are determined by reviewing the recommendations of the International Standards, the WADA Guidelines, doping statistics, and the experience gained by the doping control body. Here, firstly is taken in account the doping history of participants, the risks of prior sanction given for an Anti-Doping Rule violation (ADRV), if a sportsman returns to sport after a suspension, if he is in a team who has been found to have two or more cases of positive doping results in a competition, or if one of the Athlete's Assistant Personnel has been involved in an ADRV. At the same time, the Anti-doping Committee, as a doping control body, must carry out test distribution by combining doping risks and identifying psychological, financial, political, cultural, and other predictive factors. For example, the WAF anti-doping rules stipulate for additional tests if two athletes representing the same team have been positively identified in the same Championship, or nobody can return to sport after a suspension period before being repeatedly tested, etc. 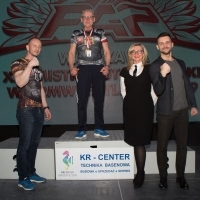 In armwrestling, it is often the case that the finalists of a category are the same from year to year, in this case a new finalist will be tested as a priority, or an athlete who has progressed by achieving a better result. To avoid testing the same athletes, from year to year, others will be selected, perhaps from other categories. A special role in this is the target test - the testing of certain athletes previously identified by the testing Authority, even if they failed to qualify, but have significantly improved sports performance or added weight, etc. Such target tests were previously carried out at the European Championship in Katowice and the World Championship in Blagoevgrad and will be carried out further, in which case the choice of each athlete is highly calculated and based on a complex system of factors and not on finger pointing, how it being speculated in the last period. It should also be noted that in armwrestling the risks of using a prohibited substance or method in competition are becoming lower compared to the risks of out-of-competition doping. The Anti-doping Committee will also initiate and run an out-off-competition test plan for athletes who will be part of the TP (Testing Pool) or RTP (Registered Testing Pool). Thus, an armwrestler can be tested at any time and in any place, according to his whereabouts, provided quarterly in ADAMS, or in any other way. This proposal has already been approved at the WAF Congress, with national federations reporting to the athletes. The current trend, recommended by WADA, is to reduce the number of tests conducted in competition to those outside the competitions, so optimizing available financial resources will be made, as the cost of non-competition tests is lower. The main rule still has to be the same, each competitor must be available for doping control at any time and any place and there are no exception! That rule is equally as the others rules in armwrestling and nobody can opposite against it. It is regrettable that informing athletes by national federations does not take place properly. Any decision of the Congress, especially anti-doping activity, must be brought to the attention of each participant so that he is educated and deeply aware of anti-doping rules, not just his rights but also his duties. This would reduce many misunderstandings, confusion and misconceptions about Anti-doping Committee's activity. One aspect of the principle of innocence says no prosecution can be filed as long as it is unfounded, and if it is advanced it will be dismissed as unfounded, especially the accusations of corruption among Anti-doping Committee representatives, which is very serious. Personally, I can affirm that all members are high-grade professionals who operate under WAF-approved anti-doping rules. Anti-doping Committee is open to co-operation, will receive any constructive criticism, and will examine any addressed request.